Peter L. Korotkevich  Chairman of the Board of Directors & President of «Korben International Industrial & Financial Corporation, Inc.», Academician of the Russian Academy of Natural Sciences  a big statesman and scientist. 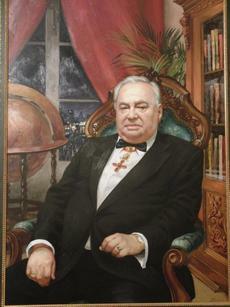 In 19911992 held the position of the Deputy Chairman of the Council of Experts under the President and the Chairman of the Government of the Russian Federation. In 19861990  the Deputy Chairman of the Scientific, Technical and Coordination Council of the Ministry of General Engineering and the Presidium of the Academy of Sciences of the USSR. He is also the Chairman of the Supervisory Board of the Fund of Presidential programs of the Republic of Buryatia. KORBEN INTERNATIONAL INDUSTRIAL & FINANCIAL CORPORATION, INC., was incorporated in December 12 1994 subject to the Business Corporation Law, New York, USA, Clause 402. It is an associated member of the U. S.-Russia Business Council, the American Chamber of Commerce, The Institute of International Finance (the Global Association of the World Financial Institutions) and the National Food Processors Association of the USA. The corporation is headquartered in Washington at: 1100, Connecticut Ave., NW, Suite 850, Washington, DC 20036. The main lines of activity of Korben International are the promotion of international, finance, economic and industrial cooperation between Russia and the developed western countries disposing of a high financial, economic and industrial potential such as the USA, the countries of Europe and the Pacific Rim, the development and integration of the Russian Federation into the world community of states with highly developed market economy as well as attraction on a constant basis of material and finance resources to resolve the tasks of funding the projects which will finally improve the financial, economic and industrial potential of the USA and Russia, inclusive European countries and the Pacific Rim and will serve for the benefit thereof. Introduction of advanced industrial and technical know-how, financial, economic and banking technologies, creation of a stock of highly liquid assets and provision of collaterals will enable to transact in securities, arrange their placement at the world financial and stock markets as well as commercial circulation leaving the same the amount of the overall debt. The use in Russia of the world financial and material resources, required for its economy, the advanced equipment, know how and management methods designed to stabilize and upturn the economy will result in considerable growth of the capital necessary to diversify the industry, create new working places, and increase the turnover both for Russia, the USA and the Pacific Rim countries. Creation in the territory of Russia, the subjects of the Russian Federation, in Moscow and S. Petersburg as well as adjacent regions of large food-processing complexes with advanced distribution system, customs terminals and disposing of the mechanisms of wholesale food sectors of the economy will enable to manufacture import-replacing products, currently imported into Russia, to achieve growth of output and production forces, to reduce budget deficit, stimulate means of production, increase GDP and replenish the Federal Budget. Influx of funds to the population will grow thereby and will improve living standards, reduce imports of food stuffs, create a stock of highly liquid assets to be used as additional collateral for any transactions including that with securities locally and overseas. Taken all together this will enable to ensure inflow of inexpensive capitals, required for the economic development of the state and private sector resulting in financial stability, gradual stabilization and an active growth of the entire financial, economic and banking system. Korben International has set up a top management group. The members of the Board of Directors and the Advisory Board dispose of big professional knowledge, international experience and important business connections in the world financial, banking and industrial community to enable the corporation achieve practical results through a widely developed network of companies in the USA, Europe and Russia. We dispose of all necessary opportunities and are prepared to offer mechanisms making it possible to reduce amounts of debt and subsequently liquidate it without increasing overall payable accounts. We are also prepared to effect measures jointly with the Government to suppress inflation and to overcome stagnation. Korben International offers a Capital Growth Program, which if implemented will enable to attract into the priority sectors of the Russian economy investments emanating from foreign states and residents under the state guarantees and debt liabilities offered by Russia. The country will thereby receive access to the world capital markets and will mobilize additional credit facilities. We are prepared to offer practical help to our customers and business partners in implementing financial, economic and industrial projects and guarantee a stable and risk-free profitability level upon implementation of projects on mutually-beneficial terms.